The Kiwi-born Baynes was a late comer to basketball, only picking up the game as a late teen – but he quickly became a standout, earning a scholarship to the AIS. After one season in Canberra, the 208cm star headed to the USA, taking up a scholarship at Washington State University. Baynes would establish himself as one of the most physically gifted big men in college basketball, helping the Cougars to several NCAA tournament runs. A brief stint in the NBA Summer League with the Los Angeles Lakers led the way to Lithuania as Baynes began his professional career. A solid first season as a European pro saw the North Queenslander earn a spot on the Boomers roster for the 2010 FIBA World Championship, leading to a move to Germany. This was started a series of one season stopovers for Baynes, moving from Germany to Greece where he claimed the Centre of the Year honour leading into the 2012 London Olympic Games. A breakout performance in London earned high praise for Baynes, with a move to Slovenia and the carrot of Euroleague competition enticing the big man to sign on the dotted line. It was a remarkable Euroleague season for Baynes, who was in the top 10 for points and rebounds despite his team getting knocked out of competition at the first group stage. These performances didn’t go unnoticed, with Baynes signing a deal with the San Antonio Spurs to join the NBA ranks alongside Boomers teammate Patty Mills and former Boomers Head Coach Brett Brown. Baynes helped the Spurs to the NBA Finals, starting for the team in their first-round playoff closeout game victory over the Los Angeles Lakers. In 2014 Baynes joined the small group of Australians who have won an NBA Championship. Alongside Boomer teammate, Patty Mills, Baynes contributed valuable back up minutes for the San Antonio Spurs; defeating the Miami Heat in 5 games. Baynes' free-agency in 2015 saw him move to Detroit, where he was tasked with playing a much larger role for the Pistons; adding toughness and experience to the young team while in the NBA off-season he achieved a goal of playing in his first Olympics. In July 2017 Baynes signed with the Boston Celtics where he started 67 games during his first season. In Boston's final game of the regular season Baynes had a career high 26 points and 14 rebounds in a win over the Brooklyn Nets. 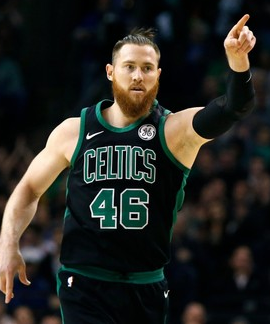 After a successful season in the Celtics lineup, Baynes re-signed for the 2018-19 NBA season.